No one likes to spend more money when it can be avoided. Instead of replacing a computer we can try to extend the life of our current one. There are several simple tasks that we all can do to keep our computers going strong for as long as they can. Of course technology will continue to advance and there will always be faster processors and larger storage drives just around the bend, but in most cases the computers that we use now are more than adequate. If properly maintained our computers will be able to last a long time and prevent unnecessary spending on computer equipment in the future. There are two primary aspects of computer maintenance that I would like to look at, the computer’s external and internal environments. The external element takes into account physical factors such as the environment, treatment, and storage of the device. On the other hand the internal aspects involve system maintenance, security software, and software updates. When attempting to prolong the years of a computer it is easiest to start with the physical facet of computer maintenance. After all what good is taking steps to protect the information on the system if we are not going to care for the actual equipment? Just like most things in life, a computer in good physical condition takes effort and the right environment. The most important environmental factors that can affect the life of a computer is temperature, humidity, electricity, an air quality. Below is a list of helpful tips on what you can do to extend the life of your computers regarding both internal and external components. A computer should be stored in 60-85 degrees Fahrenheit, any extreme temperatures can damage internal components. Minimize static electricity by keeping humidity levels at about 50%. Keep air circulating through your computer by making sure any vents on the computer are around 4 to 5 inches from any obstructions. 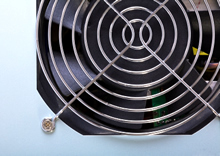 Use air filters or ionizers to avoid dust build up and cleaning the computer and any vents frequently. Use surge protectors or an Uninterruptable Power Supply (UBS). Common electrical problems such as surges, blackouts, brownouts, spikes and sags can cause damage to your computer. Avoid eating or drinking over the computer- Even though spills are easy enough to clean up problems can surface when liquids accidently get into the system. Liquids or any foreign elements introduced into a computer mainframe can cause irreversible damage. Additionally this is also a major problem for peripheral input devices like a computer mouse or keyboard. For more physical maintenance suggestions visit Computer Environment Maintenance! Once the physical setup of the computer is maintained properly you are that much closer to ensuring a long life for your computer. It becomes equally important to take care of the hard drive and other internal features of a computer as well. The following are suggestions to keep your computer healthy. Perform important software updates by establishing automatic updates. Utilize security software like anti-virus, anti-spyware, and firewall protection. Add more disk space, if necessary. Perform weekly and monthly maintenance. This includes clearing away old files, performing disk drive clean ups, managing your startup files, defragmenting your disk drive, and clearing temporary internet files. The overall life of your computer relies on the management of both its physical and internal features, so be kind to your computer and it could be kind to your wallet. This entry was posted on Friday, February 4th, 2011 at 11:53 am	and is filed under PC, PC Maintenance. You can follow any responses to this entry through the RSS 2.0 feed. You can leave a response, or trackback from your own site.